First, if you clicked over here from our eBlast, let us apologize for the typo - Sping/Spring, it's all the same. Funny thing is, we caught the error but iContact didn't update the file. Enough excuses, though. Let's just go ahead with the blog entry. As we mentioned earlier, we've just returned from several weeks of buying trips. Here are just some of the great items we found along the way. Some of already begun to show up in the stores. We have shipments scheduled almost every week until the end of March. A fun Tangerine shade of Orange is still a big trend for spring. It's been all over the style magazines for the past several months. You'll see it in our store this season, too. We'll be tempering it with soft shades of gray in some areas, but also turning up the heat by throwing in some bright turquoise and aqua from our Italian pottery lines to play against it as well. 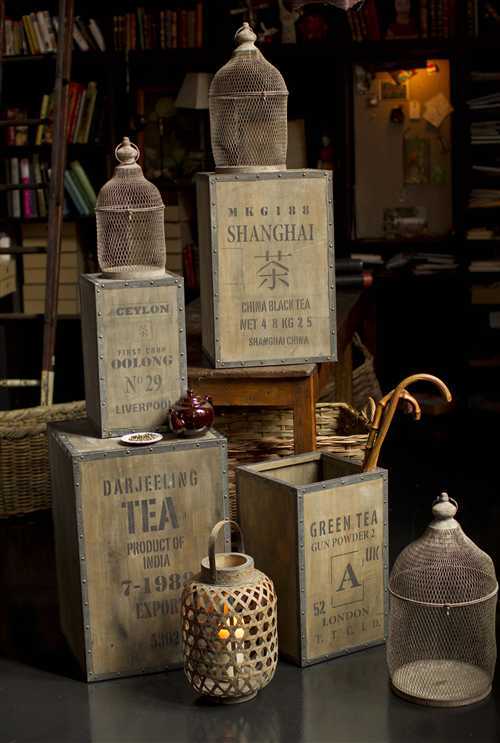 We love these wooden tea shipping boxes. They'll come in several sizes. The labels are printed in both directions so they can be used as tables or, turned over to the open end, planters or umbrella stands. They're made of rustic pine and have metal edges. 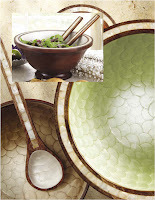 Our favorite table and serveware designer, Julia Knight, has come up with a whole new look this year. In addition to her wonderful work in metal and enamel she's now working in wood. We're thrilled to introduce "Wood Jewels", a collection she's been working on for more than a year that combines sumptuous hand-carved wood with her signature enamel and results in an elegant, organic original. 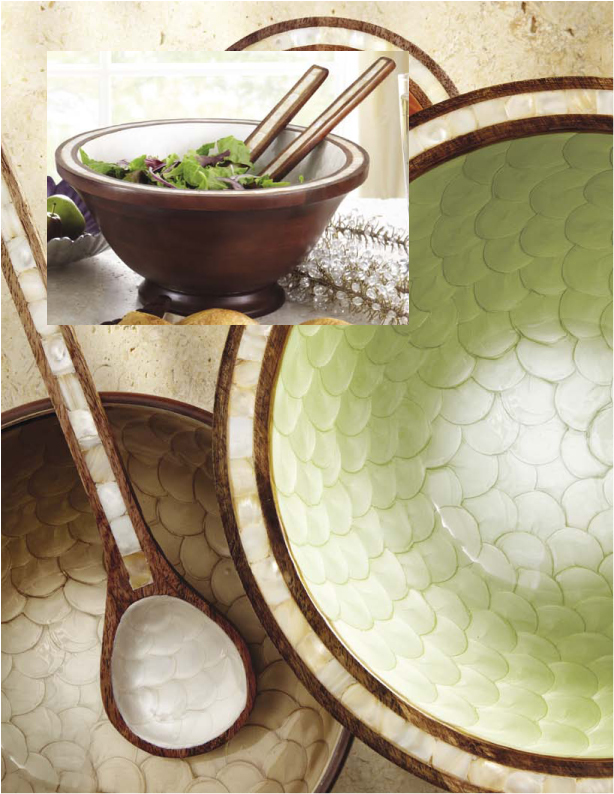 The collection includes classic salad bowls, serving platters, and smaller pieces as well. Also new from Julia, a royal "Queen Bee"design that will be all the buzz at your next brunch or soiree. Our friends at Vietri have outdone themselves with a great assortment of new Italian pots and planters for Spring. We love the mixture of tones in the blue, green, and turquoise shades that work so wonderfully here in Laguna Beach. We'll be mixing these with some beautiful grey, cream, and white tones that work right in with the bleached wood look of a rustic French setting. There are some great new terrace pots in the mix as well. Mix up all the colors to create a classic garden with the brightness of a Provencal Summer or go soft and tonal to evoke the gardens of the English countryside. 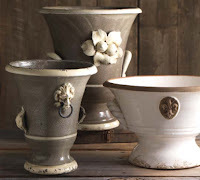 Vietri’s rustic garden collection is made of terra cotta in Tuscany. 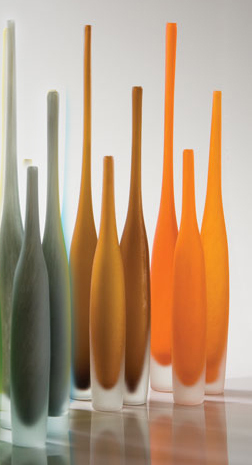 Each piece is influenced by the colors and shapes found at old European villas. The glazes have an aged feel to them and embellishments include medallions, cherubs, lions, roping, and emblems that are all influenced by Italian heritage. 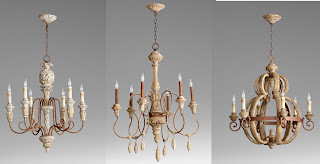 Next up is a great selection of natural wood chandeliers - equally at home in a funky beach cottage as they are in a dressed up French farmhouse. These are great just as they are, but look for some extra embellishment once they're in the store. We have a lot more to share. Keep checking back over the next few weeks for more updates. You can also click here to see new arrivals on our Stephen Frank Garden & Home web site.